It’s strange to think of Torchlight 2 as the Action RPG’s greatest hope, especially in a year that saw the release of Diablo 3, but here we are. I was an enormous fan of the original Torchlight, but there was one glaring omission: no co-op. 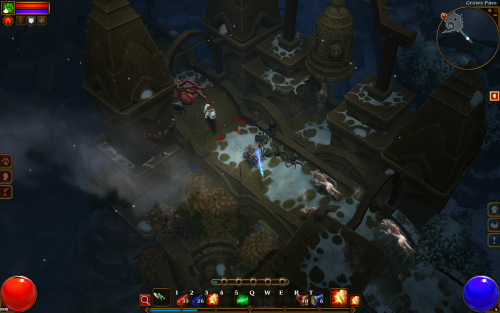 Will Torchlight 2 bring all of the charm of the original, and provide a heaping helping of co-op goodness? Yes. A thousand times yes. Rather than bring back the original cast of character classes, Runic’s gone back to the drawing board and created four new classes for Torchlight 2: the Embermage (spellcaster), Outlander (spells + ranged weapons), Berserker (crazy melee), and Engineer (melee with wonderful toys). In a nice twist, the three original classes are recast as characters in the storyline, and one of them just so happens to be a villain these days. For my adventures, I chose the Embermage. He started out by chucking spears of fire, but expanded his skills to be able to launch hot columns of fiery and/or electric death. As I added status effects to enemies, each hit I landed caused pulses of elemental pain to hit their enemies. My dual-wand slinging brought delightfully unstable effects- nothing made me smile more than my attacks suddenly spawning a huge meteor to land on top of my foes. This holds true for all classes, but my abilities made me feel almost overpowered, despite the difficulty level keeping me in check. The pet system returns from the original game with a few new additions. You can still offload all of your unwanted loot onto your furry friends and send them back to town to sell it while you’re galavanting around the countryside, but now you can even have them buy potions and other consumables for you while they’re gone. This had an unintended side effect, however, as I now resent my cat’s lack of enthusiasm when I ask him to go grocery shopping for me. Torchlight 2 is probably the most fluid Action RPG I’ve ever played. Character movement is faster than most games in this genre, and slinging abilities around is a breeze. A new charge mechanic has been added to each character- successive attacks build up a meter that provides a huge but temporary buff to their abilities. The Embermage’s charge ability allows him to hurl spells with impunity, while the Berserker’s increases his movement and attack speed. The charge abilities can really turn the tide of a difficult battle, and I’d definitely recommend building your character in a way that maximizes their effectiveness. Speaking of building your character, Torchlight 2 provides an awful lot of freedom in both the loot choice and skill selection. All characters can use all items (though some are class-restricted), so if you’d like to make an axe-wielding melee Embermage you’re more than welcome to try. You can’t respec your character or undo stat point assignment, but you can reclaim up to the last three skill points you’ve assigned for a small fee. This leaves you free to experiment with new abilities and gives you an “out” if you decide they don’t synergize well with your build. There’s a lot more variety in the game than you usually see in this genre. Boss battles come quite often, and each one is unique. Some are surprisingly challenging, and most bosses bring friends. Sadface. Special enemies called Phase Beasts lurk around the maps and defeating them spawns a portal to a challenge room where you must do things like defeat waves of enemies while standing in a zone, or simply kill a miniboss and choose to open one of three doors with his key. One particularly challenging dungeon has players having to manage a difficulty fight while trying to stay within the beam of a spotlight. The art style and music are both beautiful. Runic’s art team has really outdone themselves with the staggering amount of assets put into the environments, and the personality put into each enemy type shines. It’s a doubly impressive feat when you take into account the low-poly models used in the game.